14 Are Reported Killed In Sudan As Protesters Call For End To President's Rule Demonstrations began in December over the price of bread. Economic concerns have become political demands, and protesters now call for an end to regime of Omar al-Bashir. Protesters rally near the military headquarters on Tuesday in Khartoum, Sudan. Activists behind the anti-government protests say that security forces killed 14 people on Tuesday as troops moved to break up the demonstration. Sudan has been the site of protests since late December, when a protest began over the price of bread. The economic concerns have become political demands, and protesters want an end to the 30-year-rule of President Omar al-Bashir. As the AP reports, activists are pushing their appeal with fresh vigor after nearly four months of protests: "On Monday, for the first time, leaders of the protests called on the military's leadership to abandon al-Bashir and join their call for change. And on Tuesday, they invited military leaders to meet with their representatives to 'discuss arrangements for a transition' in Sudan." Amid the crackdown, there are signs that the government's control could be weakening. Video that was being shared on Tuesday showed some members of the military shielding protesters and site of the sit-in, the AP reported. NPR Africa Correspondent Ofeibea Quist-Arcton reports that the Sudanese interior minister told Parliament on Monday that 15 protesters and 42 security force members have been injured, and nearly 2,500 people arrested. Key sections of the security forces remain loyal to Bashir, Quist-Arcton notes. The Sudanese Professionals Union, which is organizing the protests, said in a public letter that the government's security forces, along with Islamist militias, attacked the peaceful protest for over two hours on Tuesday. They had attacked the demonstration before, the union said, but this time it was larger and more violent. The union wrote that the regime rules "with complete tyranny, using violence and the security apparatus to guard itself against the people," and argues that the government "has lost all legitimacy" since the protests began. And the union called on the international community to support their movement: "The Sudanese people continue to stand alone in the face of the regime's brutal apparatus. We urge the international and regional community to stop turning a blind eye to the ongoing situation in Sudan and to respond in an appropriate way to the crimes committed by Bashir's regime." Bashir has governed Sudan since 1989, when he came to power in a military coup that toppled the country's last freely elected leader. In 2010, the International Criminal Court indicted Bashir for genocide and crimes against humanity committed in Darfur. Reuters reports that a state news agency cited a Sudanese police spokesman as saying that police had been told "not to confront citizens and peaceful gatherings." Women in particular have played a striking role in the Khartoum protests. The photo and video of a woman standing on car, dressed in white and leading a crowd in defiant song, has gone viral. Hind Makki, an interfaith educator in Chicago, explained on Twitter that the woman's clothing is highly symbolic. "She's wearing a white tobe (outer garment) and gold moon earrings. The white tobe is worn by working women in offices and can be linked w/cotton (a major export of Sudan), so it represents women working as professionals in cities or in the agricultural sector in rural areas," Makki wrote. "Her entire outfit is also a callback to the clothing worn by our mothers & grandmothers in the 60s, 70s, & 80s who dressed like this during while they marched the streets demonstrating against previous military dictatorships." 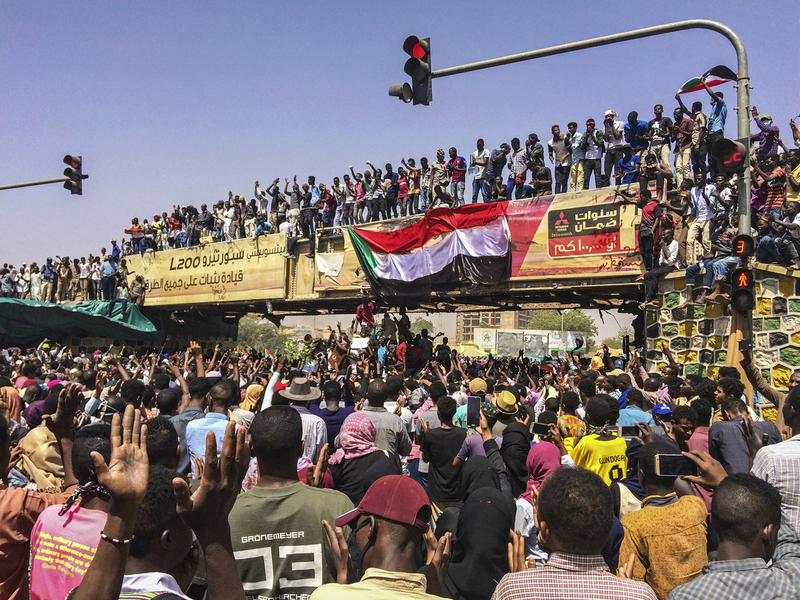 The U.S., Britain and Norway released a joint statement on Tuesday that called on Sudan's government to respond to protesters' demands and deliver "a credible plan" for political transition. "Failing to do so risks causing greater instability. The Sudanese leadership has a grave responsibility to avoid such an outcome." The three countries called on the government to lift the state of emergency, allow freedom of movement and release political detainees. The countries said they would support the process of political transition and "in time could work to help resolve some of the long term economic challenges that Sudan faces." Amnesty International criticized the violent quashing of protest. "The Sudanese authorities must stop firing at protesters peacefully exercising their freedom of expression. The killing of people who are simply taking a stand for what they believe in is completely unacceptable," Joan Nyanyuki, the organization's director for the region said in a statement. The United Nations expressed concern about the reports that government forces were using live ammunition and tear gas on demonstrators. A spokesperson for UN Human Rights said that it was "again calling on the Government and security forces to ensure that the right to peaceful assembly is fully respected and the right to freedom of expression is respected, and that a genuine dialogue is undertaken to resolve this very complex situation with very real economic and social grievances of the public."